At Lang's Kitchen & Bath, we service all bathroom remodeling and renovation needs of homeowners in certain parts of Montgomery County, PA. Whether you need a new powder room redesigned bathroom, our experts can help! 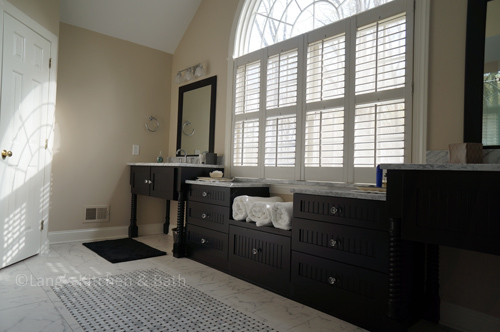 Lang's Kitchen & Bath located in historic Newtown offers the best bathroom remodeling services in the area. No matter whether you live in Horsham, Bryn Athyn, Dresher, Colmar, Blue Bell, or Abington, you can rest assured that you'll get a quality bathroom renovation when you choose Lang's Kitchen & Bath. Our bathroom remodeling company has been in the business for years and really knows what it's doing in terms of personalization and style. A bathroom renovation is usually a big deal, as it is an important space in your home. The bathroom is the one room in the entire home that most of your guests will see at some point, so it's important that you have an aesthetically pleasing bathroom. It should represent your style well while still accommodating your guests by performing all the necessary functions. The importance of considering your bathroom design beforehand cannot be stressed enough. For instance, you'll need to determine whether you require a traditional bathroom design that includes a full tub and shower or just a powder room design that only features a toilet and sink. Some homeowners choose to offer their guests a powder room where they can freshen up without having to access the main bathroom that houses the bathtub and/or shower. Of course, you'll also want to consider your own needs as well, such as whether or not you require room for two or more in your bathroom. 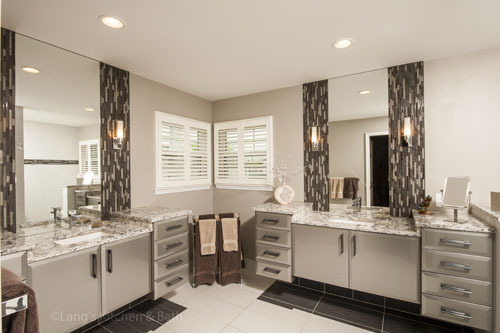 Regardless of whether you plan on getting a powder room design or a traditional bathroom design, the process for drawing up a course of action with our company is the same as with any of our home remodeling services. We'll first offer you a consultation, during which time we'll learn more about your needs and wants. After that, we will discuss options for your space and then present you with a design plan and a pricing analysis with several options. You will choose the option that you like and give us the go-ahead, once you are ready to select us as your bathroom remodeling company. We aren't known as one of the best bathroom remodeling companies in the area for nothing. Our staff is friendly and eager to assist you with all your home renovation needs. We can help you with everything from picking out bathroom tiles to designing custom cabinets to fit your space.